And the public’s impressions of the national media may be influenced more by their opinions of cable news outlets than their views of other news sources, such as network or local TV news, newspapers or internet news outlets. When asked what first comes to mind when they think of “news organizations,” most name a cable news outlet, with CNN and Fox News receiving the most mentions by far. The Pew Research Center for the People & the Press has been tracking views of press performance since 1985, and the overall ratings remain quite negative. Fully 66% say news stories often are inaccurate, 77% think that news organizations tend to favor one side, and 80% say news organizations are often influenced by powerful people and organizations. The widely-shared belief that news stories are inaccurate cuts to the press’s core mission: Just 25% say that in general news organizations get the facts straight while 66% say stories are often inaccurate. As recently as four years ago, 39% said news organizations mostly get the facts straight and 53% said stories are often inaccurate. 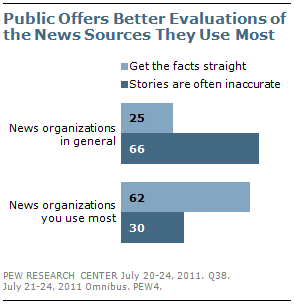 But Americans have a very different view of the news sources they rely on than they do of the news media generally. When asked to rate the accuracy of stories from the sources where they get most of their news, the percentage saying these outlets get the facts straight more than doubles. Fully 62% say their main news sources get the facts straight, while just 30% say stories are often inaccurate. The biennial news attitudes survey was conducted July 20-24 among 1,501 adults nationwide, with supplemental data collected on other, smaller surveys in June, July and August. These surveys find that while the public holds news organizations in low regard, they are more trusted as a source of information than are federal, state and local governments, the Obama administration and business corporations. Nearly seven-in-ten (69%) say they have a lot or some trust in information they get from local news organizations, while 59% say they trust information from national news organizations. By comparison, about half say they have a lot or some trust in information provided by their state government (51%) and the Obama administration (50%). Smaller percentages trust information from federal agencies (44%), business corporations (41%), Congress (37%) or candidates running for office (29%). Overall, television continues to be the public’s main source for national and international news. Currently, 66% say they get most of their news from television, while 43% cite the internet as their main news source. While this is little changed from last year, over the long term the gap between TV and the internet has narrowed: Four years ago, roughly three times as many people cited TV than the internet as their main source of national and international news (74% vs. 24%). Despite the growth of internet news, it is clear that television news outlets, specifically cable news outlets, are central to people’s impressions of the news media. When asked what first comes to mind when they think of news organizations, 63% volunteer the name of a cable news outlet, with CNN and Fox News by far the most prevalent in people’s minds. Only about a third (36%) name one of the broadcast networks. Fewer than one-in-five mention local news outlets and only 5% mention a national newspaper such as the New York Times, Wall Street Journal or USA Today. Just 3% name a website – either web-only or linked to a traditional news organization – when asked what comes to mind when they think of news organizations. The survey finds that the growth in negative attitudes toward the news media in recent years in several key areas has come among Democrats and independents. Since Barack Obama took office, the proportion of Democrats saying that news stories are often inaccurate has risen sharply, and they are now nearly as critical as Republicans. 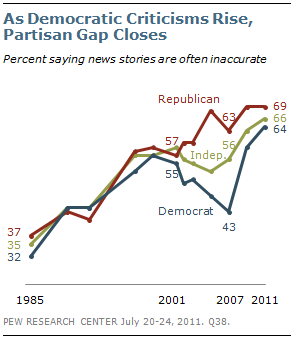 In 2007, 43% of Democrats and 56% of independents said stories were often inaccurate. Since then, the percentage of Democrats expressing skepticism about the accuracy of news reports has increased by 21 points to 64%, and the percentage of independents saying this has grown by 10 points. Republican views have held fairly steady: 69% see stories as often inaccurate, little changed from four years ago (63%). While the press’s overall reputation in many areas has declined, majorities continue to say that news organizations care about how good a job they do (62%) and are highly professional (57%). However, these evaluations also have slipped somewhat since 2007. 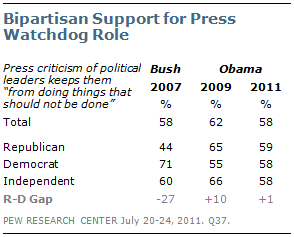 Partisan differences in views of the press’s watchdog role have disappeared in recent years. In 2007, during the Bush administration, 71% of Democrats and just 44% of Republicans said press criticism of political leaders was worth it because it kept them from doing things that should not be done. In 2009, after Obama took office, somewhat more Republicans (65%) than Democrats (55%) favored a watchdog role for the press. In the new survey, nearly identical percentages of Republicans (59%), Democrats (58%) and independents (58%) support the watchdog role. The survey finds that most Americans prefer news with no political point of view, and this feeling is particularly widespread when it comes to getting news online. 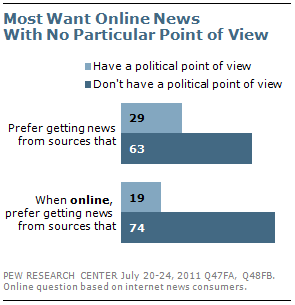 Fully 74% of online news consumers say they prefer internet sources that do not have a political point of view. Just 19% prefer sources that have a political point of view. Social networking has expanded the ways in which the public gets news and information. About a quarter (27%) of adults say they regularly or sometimes get news or news headlines through Facebook, Twitter or other social networking sites. This rises to 38% of people younger than 30, but now spans a notable share of older Americans (12% of those 65 and older) as well. Most of those who get news from social networks (72%) say they mostly just get the same news and information they would get elsewhere. 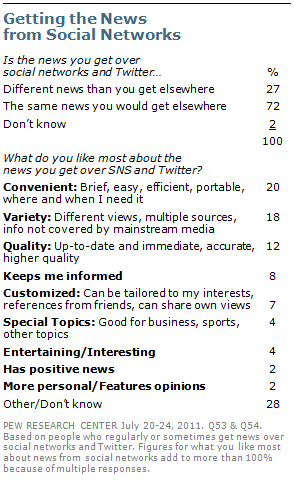 Just 27% say the news they get over social networking sites is different than the news they get elsewhere. And when asked to describe what they like about getting news over social networks and Twitter, answers range from features of the technology such as speed, portability and brevity to ways in which the content is more customized, personal and topical. While the public has long been critical of many aspects of the press’s performance, negative attitudes are at record levels in a number of areas. The percentage saying news organizations are often influenced by powerful people and organizations has reached an all-time high of 80%. Other measures, including the press’s perceived lack of fairness (77%), its unwillingness to admit mistakes (72%), inaccurate reporting (66%) and political bias (63%) match highs reached in 2009. The public is about evenly divided over whether news organizations are immoral (42%) or moral (38%), but the proportion saying the press is immoral also equals an all-time high. 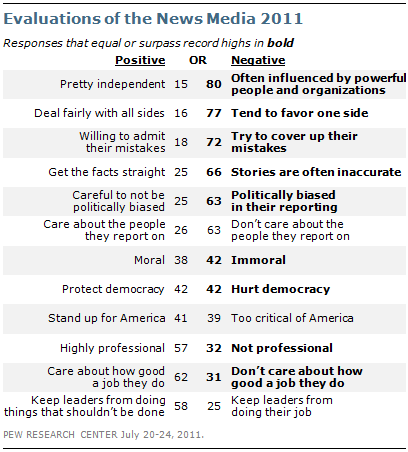 On the positive side, majorities continue to say that news organizations care about how good a job they do (62%) and are highly professional (57%). 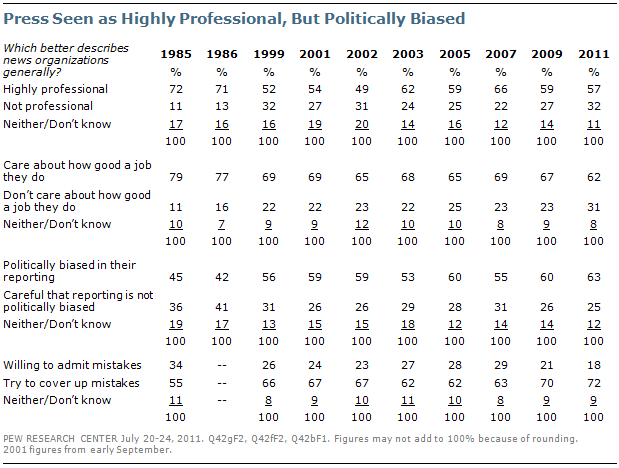 However, the percentage saying news organizations do not care about how good a job they do (31%) is at an all-time high, while the percentage saying they are not professional (32%) equals its previous high, reached in 1999. In the Pew Research Center’s first survey on news attitudes in 1985, majorities said that news organizations were often influenced by powerful people and organizations (53%) and tended to favor one side (53%). However, by a 55% to 34% margin, more Americans said that news organizations get the facts straight than said their stories were often inaccurate. 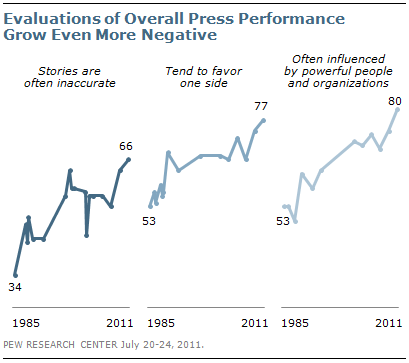 Opinions of news organizations in all three areas have grown more negative since then. And since 2007, there have been increases in the percentages saying that news stories are often inaccurate (from 53% to 66%), that news organizations are often influenced by the powerful (from 69% to 80%), and that news organizations tend to favor one side (from 66% to 77%). A majority (57%) views news organizations as highly professional, while 32% say they are not professional. 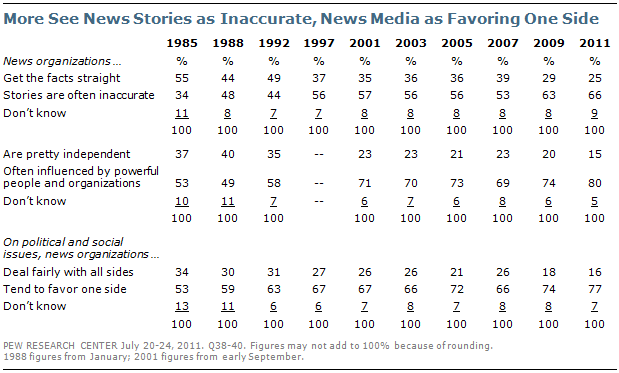 However, the percentage saying news organizations are not professional has risen 10 points since 2007. About six-in-ten (62%) say news organizations care about how good a job they do. However, just 18% think the media is willing to admit their mistakes; this is little changed from 2009 (21%). By two-to-one (62% to 31%), more Americans say that news organizations are politically biased than say they are careful to avoid biased reporting. These views have changed only modestly in recent years. During the mid-1980s, far fewer said news organizations were politically biased; in Pew Research’s first news attitudes survey, 45% said news organizations were politically biased while 36% said they were careful that their reporting was not politically biased. The news media also is faulted for invading people’s privacy and focusing too much attention on bad news, but these opinions have not become more negative over the past quarter century. In the current survey, 69% say news organizations invade people’s privacy, while 24% say they respect people’s privacy. In 1985, about as many (73%) said the press invaded people’s privacy. About two-thirds of Americans (66%) say news organizations pay too much attention to bad news, while 24% say news organizations report the kinds of stories they should be covering and just 3% say the media pay too much attention to good news. These opinions have varied little over the past decade. For the first time in a Pew Research Center survey, as many say that news organizations hurt democracy (42%) as protect democracy (42%). 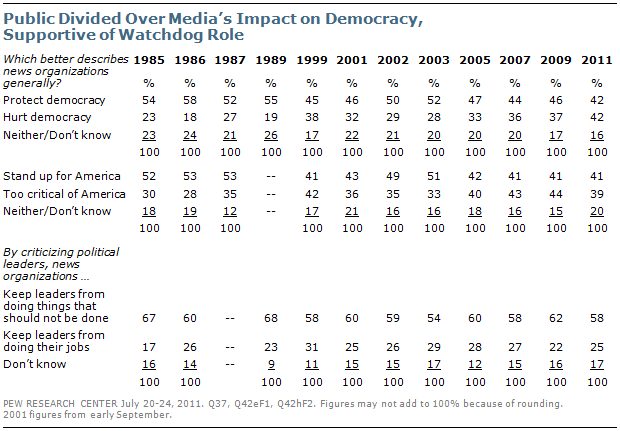 In the mid-1980s, about twice as many said that news organizations protect democracy rather than hurt democracy. The public also is divided over whether news organizations stand up for America (41%) or are too critical of America (39%). These opinions have changed little in recent years, but in 2002 and 2003 somewhat more said that news organizations stand up for America. Yet majorities have consistently expressed the view that criticism of political leaders by news organizations keeps them from doing things that should not be done. Today, 58% say this, while just 25% say that the news media’s criticism keeps political leaders from doing their jobs. Even as attitudes toward the press have grown more negative, support for the press’s watchdog role has remained stable. Over the past decade, Republicans have been more critical of the press’s performance than have independents or Democrats. But partisan differences in a number of areas have narrowed in recent years. Views of media accuracy and independence have become much more uniform across partisan groups, as Democrats and independents express increasingly critical views. 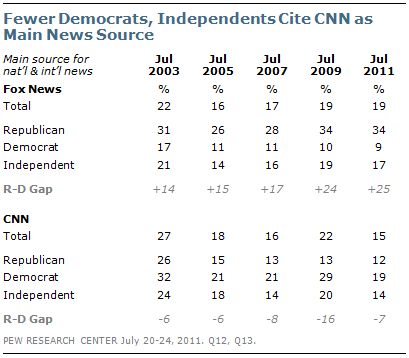 Since 2007, the percentage of Democrats saying news organizations are often influenced by powerful people and organizations has grown by 12 points; there has been a comparable increase among independents (14 points). Meanwhile, Republicans’ views have shown less change. Even on issues where there continue to be substantial partisan differences, such as in views of political bias and whether the media is too critical of America, the gaps have narrowed. Three-quarters of Republicans (76%) say news organizations are politically biased, a view shared by 54% of Democrats. 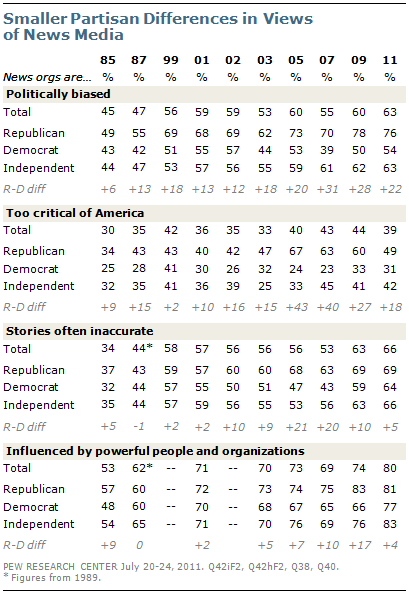 In 2007, 70% of Republicans but only 39% of Democrats said the press was politically biased. Views on this question among independents have changed little (63% now, 61% in 2007). Four years ago, Republicans were much more likely than Democrats to view the news media as too critical of America (63% vs. 23%). But in the current survey, far fewer Republicans (49%) say this, while the proportion of Democrats that see the press as too critical of America has grown eight points to 31%. Democrats (64%) and independents (66%) now are about as likely as Republicans (69%) to say news media produce inaccurate stories, a notable shift from just a few years ago, when Democrats and independents had more faith in media accuracy. Partisan gaps on these two issues had been as high as 21 points for inaccuracy and 17 points for influence, but the divides have narrowed to 5 points and 4 points, respectively. Despite their declining assessments of news media, Americans say they trust the information they get from news organizations more than they trust information they get from other places, including government and business sources. The public is most inclined to believe information from local news organizations: 69% say they trust such information a lot (17%) or some (52%). Almost six-in-ten (59%) say the same about national news organizations: 14% say they trust a lot of what they learn from the national media, while 45% say they have some trust in information provided by national news organizations. By comparison, Americans are about evenly divided over whether they trust information from the Obama administration: 50% say they trust it a lot or some, while 48% have not much or no trust in administration information. The public also is about evenly split over whether they trust information from their state governments (51% a lot or some, 47% not much or not at all). Fewer trust information from federal government agencies, business corporations or Congress. Just about three-in-ten trust a lot (1%) or some (28%) of what they learn from candidates running for office. 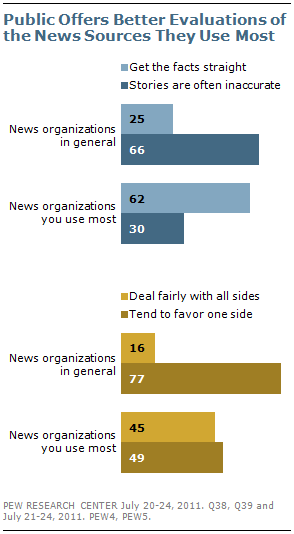 There are no partisan differences in how much people trust national or local news organizations. About six-in-ten Republicans (62%), Democrats (60%) and independents (58%) say they trust a lot or some of the information they get from national news organizations. Figures are higher for local media: 75% of Republicans, 68% of Democrats and 69% of independents trust at least some of the information they get from local news outlets. However, among Republicans and Republican-leaning independents, those who agree with the Tea Party movement express more skepticism about national media trustworthiness than do those who disagree or have no opinion of the Tea Party. Almost half of Tea Party supporters (47%) say they do not trust information from national news organizations much or at all, compared with only 31% of those who do not agree with the Tea Party or offer no opinion of it. 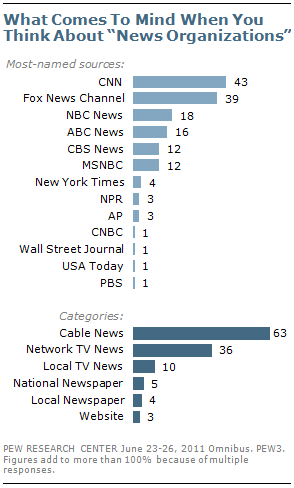 There is no difference by Tea Party support when it comes to trust in local news organizations. Older Americans are notably less likely to trust information from national news media: 47% say they trust information from national news organizations a lot or some; about six-in-ten in all other age groups say the same. Despite their negative views about the press and the accuracy and fairness of its reports, most people say they are able to find news that is accurate. About six-in-ten (62%) say the news sources they use most generally get the facts straight; by comparison, just 25% say that news organizations generally get the facts straight. While the vast majority of people say the press, as a whole, tends to favor one side (77%), the public is divided over whether the sources they rely on most deal fairly with all sides or not. About half (49%) say the news sources they use most tend to favor one side, but about as many (45%) say their choice sources treat all sides fairly. There are only modest partisan differences in people’s views of the accuracy and independence of the news sources they use most. 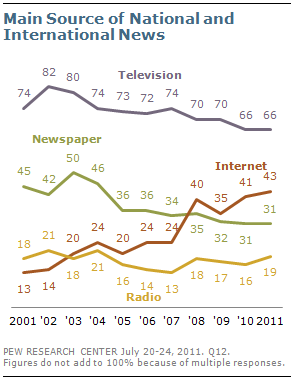 The public’s top two sources of news remain television and the internet. Two-thirds of Americans (66%) say television is where they get most of their news about national and international events, while 43% say they turn to the internet. About three-in-ten Americans (31%) say they get most of their national and international news from newspapers. Radio was a distant fourth choice, with 19% saying they turned to it for news. (People were allowed to name up to two sources). Television has dominated news consumption since the question was first asked in 1991, though the proportion naming it as a main source has declined over the past two decades. Throughout the 1990s and into the early 2000s, about eight-in-ten named television as their main source of national and international news. The top sources of TV news are the Fox News Channel, cited by 19% of the public, CNN (15%), and local news programming (16%). Audiences for the Fox News Channel remain divided along partisan lines. About a third of Republicans (34%) cite Fox as their main source of national and international news, compared with 17% of independents and 9% of Democrats. This is little changed from 2009. Over the same period, the total audience for CNN, meanwhile, has declined from 22% of the public to 15%. Most of that decline has come among Democrats (down 10 points) and independents (down 6 points). Television also is the most frequently cited source of local news, with 59% citing it as a main source. Newspapers are cited more often as a source of local (39%) than national news (31%). By contrast, just 17% cite the internet as their top source of local news, less than half the percentage citing the internet as their main source of national and international news (43%). 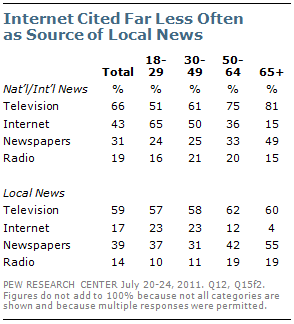 The internet is on par with radio (14%) as a local news source. There continue to be large age differences in the main sources for national news. Among those younger than 30, the internet far surpasses television as the main source for national and international news (65% vs. 51%). Television is the most frequently named source for older age groups, though the gap is fairly modest among those 30 to 49 (61% television vs. 51% internet). Those 65 and older are only age group in which more cite newspapers (49%) than the internet (15%) as a main national news source. The internet is cited about as often as newspapers by those 50 to 64 (36% internet, 33% newspapers), and far more often by younger people. Age differences are less pronounced in the leading sources of local news; majorities across all age groups cite television as their main source. Those under 50 are far more likely than older Americans to say they get local news from the internet, though only about quarter (23%) do so. Across all groups, newspapers are mentioned more often as a source for local than national news. The difference is particularly notable among those younger than 30 – 37% say they rely on newspapers for local news compared with 24% who cite newspapers as a main source for national and international news. When asked about the number of news sources available, 37% say the number of national news sources is growing while far fewer (13%) see the number of sources as shrinking; 47% say the number is staying the same. However, about as many say the number of local news sources is shrinking (21%) as growing (19%); 55% say the number is staying the same. Those younger than 30 are much more likely to say the number of national news sources is growing (47%) than are those 65 and older (29%). This may be related to young people’s greater reliance on the internet for national news. About half of internet news users (51%) say that when they last looked for news on a specific topic or story on the internet, they went first to a website that offers links to stories from many news organizations; 43% say they went directly to the website of one of their favorite news organizations. Among all internet users, search engine sites were the most popular place to look for news about a story or topic, with 21% citing Google and 14% citing Yahoo. 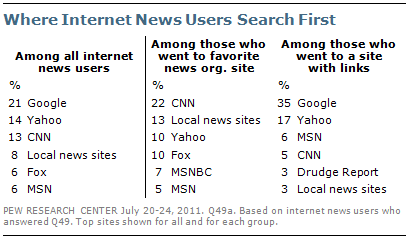 CNN is the most popular news-organization website for searching, overall, offered by 13% of all internet news users. Among those whose last news searches took them first to a favorite news organization, CNN tops the list, with 22% citing it, followed by local news sites (13%). Yahoo and Fox also are popular options (10% each). Among those who went first to a site with links to other sites, Google was the most popular first destination, with more than a third naming it (35%), followed by Yahoo at 17%. More than six-in-ten Americans (63%) say they prefer news sources with no particular point of view, while 29% prefer sources that have a political point of view. The preference for news without a political point of view is even stronger when it comes to online news: 74% of those who get news online want it to come without a political point of view, while just 19% prefer online sources that have a point of view. About as many Democrats (35%) as Republicans (31%) say they want news with a political point of view; 24% of independents say this. The partisan differences are more pronounced for online news: 32% of Democrats prefer online news with a political point of view, but just 16% of Republicans and 14% of independents want the same. Even when the public has been asked whether they want news from their point of view, the clear preference is that the news have no particular point of view. In Pew Research’s 2010 media consumption survey, 62% said they wanted news with no particular point of view while just 25% wanted news from their point of view.